Who represents the best of Buckingham’s businesses? If you feel like your favourite butcher or baker isn’t getting the recognition they deserve, the Buckingham Society are keen to help. The organisation host their second ‘Trader of the Year’ competition over the next month, tallying votes from the general public to crown the town’s favourite independent store. For four weeks in October and November shoppers in Buckingham are encouraged to pick up a form and nominate their favourite outlet. 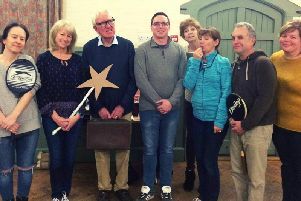 Over 500 people contributed to the competition last time around, crowning “At Home” from the Hidden Quarter in Well Street as the eventual winner. This year’s victor will receive a congratulatory shield to display, at the switching on of the Christmas lights on November 26. Nomination papers will be available in shops throughout the town and at the Old Gaol and completed forms should be returned to the Tourist Information Office. Voters are also being asked to put forward their favourite café or restaurant for consideration. Roger added: “Buckingham is blessed with a great variety of excellent places to eat and drink and the new award aims to recognise this.